This post is on cards since 18th January 2016. Yes, talk about falling back the schedule. Also because its very lengthy, it was not just getting done. Its worth the read I promise and have got tips and tricks that will save time and money on your next party. 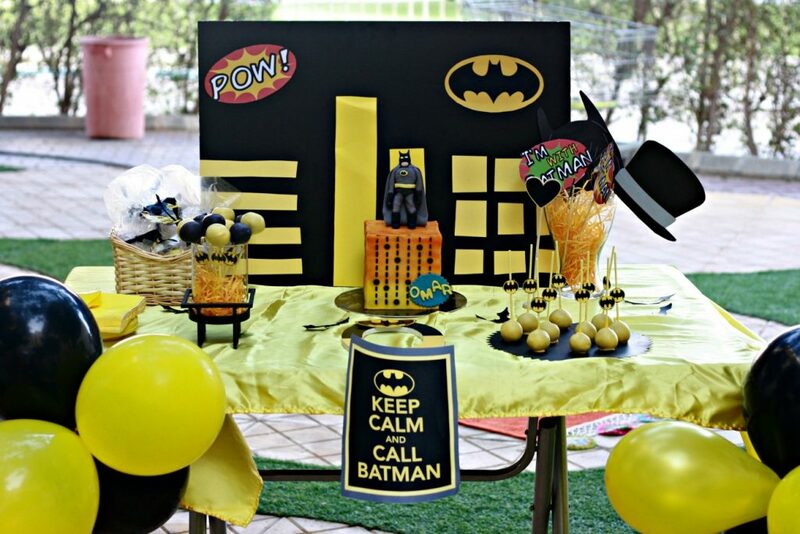 I did this batman theme party in less than 24 hours and if I can pull it off you can do as well, here is how. Have you been getting a bit overwhelmed with all the themed parties going around? The picture perfect setups, coordinated food items, suitable giveaways and what not. The social media specially Pinterest features some really cool almost enviable themes, designed and carried out with perfection. (You can check my Pinterest for various themed party ideas here). First of all, bear in mind, it’s not a one man show – often perfect parties involve two or more people/teams for desserts, savory items, decoration, photography and games. Once in a while, we want to do a little more extra effort for kids or in general theme parties be it brunch or dinner to wow the guests and make them memorable. I used to obsess over theme parties when this trend first hit and every year since 2009 I used to do a theme party for my kids. Not any more, atleast not on that scale, partly because my kids don’t prefer it and partly because of my work commitments and priorities. As my elder one who is 11 says, she prefers mummy to be free without any work and prepare her favorite meal and we all sit and have a nice leisure family day. Younger one however is 6 now and last year he was going crazy over batman. No surprises when he wanted a batman party. I discourage character obsessions for various reasons and thats why the previous parties I had arranged were Clown theme party, Rainbows, Under the Sea, Flower Power and Butterfly. You can find the pictures here for inspiration. For this post I decided to go for batman theme because it took me only a day to put together. Super quick and stress free! Coming back to the batman party, I had only 24 hours to plan and execute the party as I wanted it on same day as my son’s actual birthday. A small affair of very close friends and neighbors, mainly my son’s friends and their moms. An invite was sent out and even on urgent notice and being a weekday, they all turned up with full enthusiasm. Normally I make themed invites but since there was hardly anytime and I was not sure if I would be able to pull it off I kept it to message invites. I made a trip to two shop – one grocery store and one art supply store. I will break down into following steps on how I planned and executed the batman theme party in less than 24 hours. 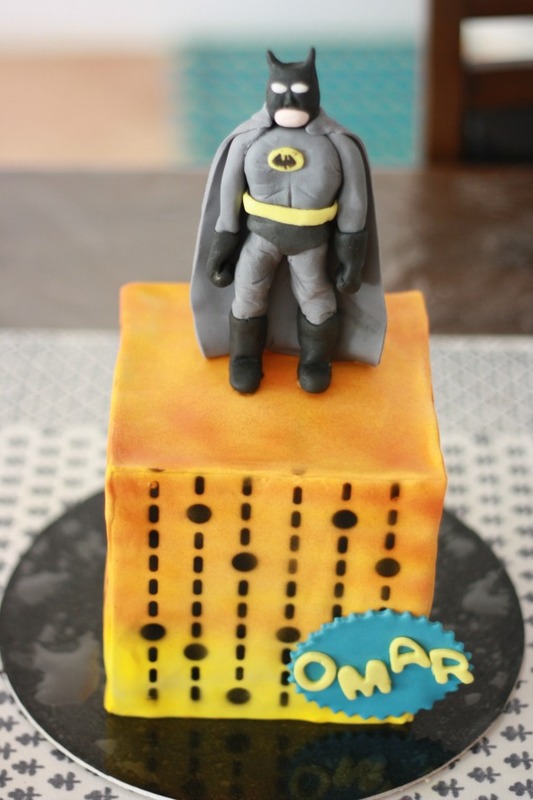 The steps apply in general to any theme and I will give examples of Batman party. Decide upon a theme – This is the most important and crucial step as this will then dominate the next steps. Theme can be as simple as choosing a color or an object like balloon, butterflies, edible items like ice cream, cookies and milk etc. to more challenging like a movie/cartoon character. Basically based on you child’s interest/character and likes. If you have time, you can choose anything but if you are pressed for time, choose something for which you can source the supplies rather easily or for which you already have few items in hand. I chose batman as my son had already lot of items related to it including a full batman costume with which he wore angry expressions too to coordinate. Choose a venue – It can be your living room, backyard, outside (a bit isolated) area, a party hall or another venue of a some place you have rented. Keep in mind the number of guests, games you want the kids to play, weather etc. Since it was mid January, I chose a rather quite place outside my house in the compound which I live in. Its surrounded by greenery which makes it a little isolated for privacy and is just at the back of my house. Balloons – I prefer helium balloons as they can add lot of color, character and fun element to the party without spending a lot. Though normal balloons would work just fine, make sure they are placed strategically. Instead of bunch of balloons, a big, related character or a coordinated colored balloon will add lot of interest too. I got some normal yellow and black balloons to spread on the grass, and tie a few bunches on the dessert table sides. Backdrop – A backdrop will add a professional touch not only to your party but also to your pictures. It can be some interesting pictures of your child, laid out on a foam core color coordinated board or a balloon arrangement, big poster size of your kids favorite character or merely a bunting with your child’s name. Add colors, disco paper, big stickers, pictures hung on a string with pegs etc. Look around for similar colored objects you have and you might want to add them. Don’t be afraid to do something out of the box yet keeping it simple and trendy. I just took a black foam core board, added some shaped to resemble buildings cut out from post card giving them a skyline look. Threw in some batman logo and stickers and it was ready. Hardly took me 30 minutes to make it. Kids can be of great help in this. Cutlery and Crockery – Colorful cutlery and crockery along with matching napkins are easily available these days. They not only fill up the table space but look like the nice details have been taken care of. I just chose some yellow plates, forks, spoons and napkins. Table Cover – Again, disposable table spreads or satin table clothes are available in huge variety of colors. Get a few table covers in basic colors if you are buying satin ones, like yellow, red, pink, blue and green which will cover almost all the themes for future also. If not, a basic white one would do the job. I used my yellow satin one which has been used in so many parties and the best thing is they can be washed and cleaned very easily. Picture Booth and Props – This is such a fun activity for kids and adults alike. Everyone loves to be photographed and if the right props and background is provided, they will pitch in with some super cool shots. And guess what, its easy to put it together. You can resort to internet for some free props printables (use this keyword along with your theme name) which you can print, stick on cardboard, cut out and add a stick. Backdrop can be any draped fabric accessorized with fairy lights, big sparkling stickers or simply the dessert table itself. A hollow rectangular frame would also add lot of charm. I just cut out some batman related props and placed them in a transparent vase filled with paper shreds and everyone was just ready to strike the pose. Addons – Well you can add place mats along with individual sitting for kids, more decoration for entrance with signs and steps, some cool props for kids to wear, music, center pieces and well, you know list can go on. I just laid a mat for kids, some batman cutouts to place on dessert table, a coordinated initial letter of my son’s name and a keep calm poster. When nothing works, a Keep calm poster would do. Desserts and Food – Well now lets get to the real thing. Desserts first please. “A party without a cake is just a gathering” – Julia Child. So yes, cake is essential. You can get a themed cake from a local bakery or home based businesses who provide a great value for money. If you are on a budget, you could bake it yourself or request a family member or friend. Even a simple cake can be transformed into something coordinated by pasting an edible plaque or inedible print on edible plaque, a simple banner on sticks would also do. /you can even get toys related to theme to be placed on a cake. (Make sure you make them food safe using chocolate or saran wrap). Same goes with cupcakes which add very nice accent to the dessert table. I made a themed cake (yes took the advantage here 😉 ) , some yellow and black cake pops and cookies as giveaways. You can use plain or simple frosted cupcakes and add an inedible topper picks on top. 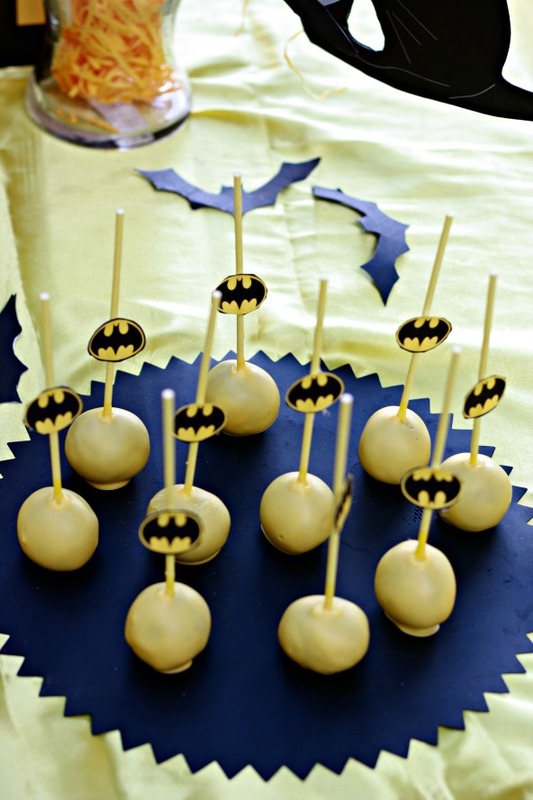 Same goes with cake pops, you can get any candies on sticks even and add a little printable. Savory items can be some takeaway home delivered deals, some super easy kids friendly dishes. I made sandwiches, nuggets and chips, pasta and mix chaat and served everything ins big disposable aluminium trays for easy cleanup. You can use small water bottles and also customize them with theme labels. Giveaways – The have become a necessary item in parties. I prefer something useful and which can be enjoyed by kids. You can give age appropriate books, stationary items, a small toy, a goody bag with various goodies or any edible item. 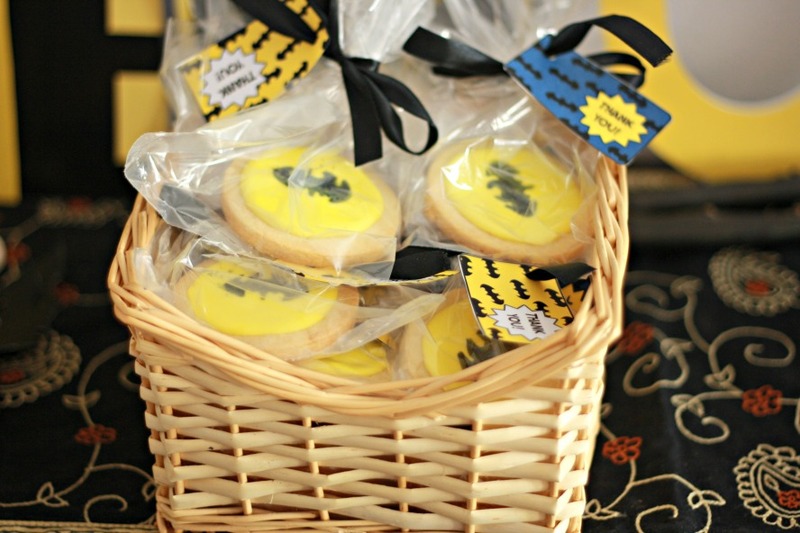 I made some themed cookies and wrapped them in individual plastic bags tied with a yellow ribbon. You can find this super simple cookies recipe with icing here. Games and Photography – You should be preparing some simple, interesting and easy to understand games to keep the kids busy. Musical chair and passing the parcel are classics, understood by everyone, keep the adults and kids entertained and needs to turn on the music on high! Do some posing and clicking and you are just 24 hours away to get that party started! I hope you find this useful and will make you super proud of yourself when you are done executing it. Less time to plan and arrange means more energy to enjoy the party. « Go bananas with this healthy banana bread!